In this article in Perspectives A PUBLICATION OF THE NATIONAL ASSOCIATION FOR BILINGUAL EDUCATION, Anita shares her views on the value of immersing multiple languages in a child's education. I will cover some important points she made in her article and how they connect to our roles as teachers. A child first needs to develop phonemic awareness and strong vocabulary, skills they can only gain through speech and interactions. Anita valued her children's multilingual skills far more than just learning English. She wanted her children to continue building their multilingual skills. The only way a child can begin to read and write is by having interaction skills and fine-tuned experiences that collaborate and simultaneously build their critical thinking skills through language - the primary literacy. Meaning that her children had to be exposed to academical language in Hindi, Spanish and English. Anita, uses the Ten Pillars of a Good Childhood to illustrate the importance of home language maintenance and why it should be a priority in quality preschools to foster multiple languages and not only ENGLISH. "Successful early and lifelong education is contingent upon sustained use of one’s primary language." As educators, we go through multiple training's to helps us embrace our students abilities and make families part of our learning community. In my five years as an educator, I have never had a training that brought attention to our deficiency in only providing literacy skills in English. We need to denounce the idea of creating only strong English only speaking students. It's time to be global, to leave the idea of behind we have told parents over and over again through the years "you take care of Spanish at home and I'll take care of English at school". How do we know our parents will provide a strong academical Spanish to our students. How is it okay to quickly give off this responsibility?If we want our students to be 100% successful we have to provide them the skills to develop their primary literacy in both English and their home language. Taking on full responsibility for their language development of their languages and cultures. Anita, enrolled both of her children in a preschool setting with fear of her children losing Hindi, and Spanish. The children had entered a world where English was dominant and their multilingual experience at home was completely disregarded. The teacher's only spoke English, 100% of the instruction was in English, the only language spoke in school was English. Anita's children resisted and rejected their home languages since English was all they heard and knew outside of home. They began to establish a negative attitude to learning another language other than English, they did not want to speak Hindi and Spanish at home no more. One of her daughters heard one of the teachers use Hindi at school and her teacher Carrie in third grade had Cultural Pride Day where the students had the opportunity to embrace their culture. Just so you know, you do have magical powers, including the power to build and affirm in each child confidence and pride in their home languages and in their personal and multicultural identities, and we greatly appreciate your desire and ability to help children embrace that which few teachers frequently talk or talk about . . . . Sahara and her classmates are truly fortunate to have you. No wonder Arushi, like many others, still says “I love Mrs. Lawson! She’s my favorite teacher!" This helped her daughters develop a deep respect for differences and denounce the negative attitude toward other languages than English. This is by far the most important point in the article for me since it is something I am currently living at the school, community and classroom I teach in. My student's do not want to speak Spanish, their parent's are unsure of why they should learn in Spanish and in school I am the only bilingual teacher that fluently speaks Spanish and English. It is hard to embrace Spanish at school since about 95% of the staff only speaks English. 3. 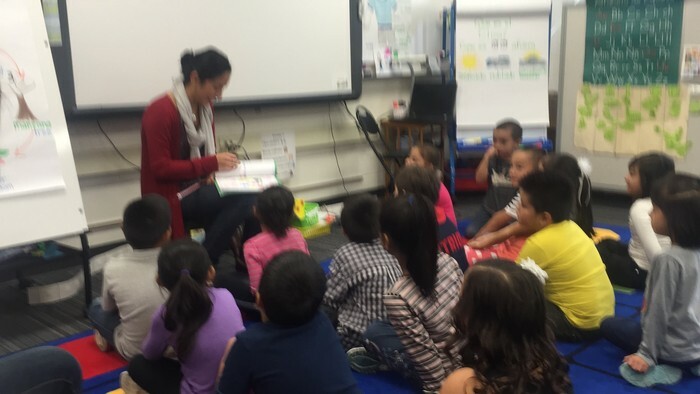 "ELL's" in bilingual programs "AT RISK"??? This hits home since I was a preschool teacher for three years and one of the top "at risk" factors to qualify for a free preschool program was knowing a language other than English, an English Language Learner. Those students were then placed in my "bilingual" classroom (there was no bilingual kindergarten so I only gave support to students who needed it). I had to make sure my students developed dominance of the English language as they were going to be tested in English to see how Kindergarten Ready they were. In all the staff meetings my students were always referred to "at risk" the incapable. I think it is highly important to bring awareness to these unfortunate labels that students whose home language is not English carry. It should not be seen as a disadvantage, to speak another language at home other than English. I think some of the negative and misunderstandings of teaching students who are learning English are a reflection of the teacher's who are not prepared to teach this students. All teachers should want their students to be globally competent, therefore embracing language proficiency in more than just English. We tend to consider students’ abilities and scores in English as the primary gauge of success and often forget that actually growing their home language skills is the fastest and most effective way to attain this objective. If in the process, students learn two or more languages and cultures, and two or more ways of constructing and analyzing their world, what’s wrong with that? Isn’t their love for more than one language likely to make them more creative and globally competitive? Every school driven by data...How well are our students learning? What are their greatest areas of need? What can we do to close the gap? are some questions asked when analyzing assessment results. The focus is the academics. No one would even imagine that language would play an important part in helping students reach their max. Most districts would go around in circles trying to implement other strategies to help close the achievement gap and completely disregard developing their students home language as a powerful strategy to implement. Anita's statement - Achievement gaps persist when monolingual and monocultural instructional practices are employed. - made me gasp. No wonder why the current school I teach has chosen to adopt a Bilingual Kindergarten Program. Anita further explains that there is no research out there that states that bilingual education is a waste. She states there is increasingly more research stating the benefits of integrating other languages in classrooms across America. ” Why then is it taking us so long to understand this simple point (i.e., that language that is easily understood = success)? is something she questions. We need to put an end to sociolinguistic biases that are so ingrained and pervasive in our society. We live in America, a place which continues to be multilingual and multicultural. We need to focus on our students needs to succeed by embracing their language and cultural differences and incorporating them in their school experiences; and not something they only have at home.